WASHINGTON — The Washington Free Beacon reported a recent clip, featuring President Barack Obama, has emerged where he praises the architects of ObamaCare. 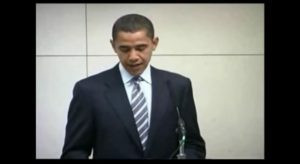 But, this new video unearthed by Phil Kerpen and the organization called American Commitment, shows Obama knew who Gruber was. And, news surfaced that Gruber was paid up to $6 million for his help on ObamaCare.